When you purchase a high quality commercial PVC marquee of a certain size, you have invested a great deal of money and you are hoping that this investment is a good one. 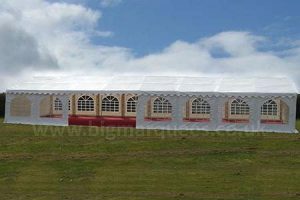 If you have done your research correctly and have purchased the correct marquee, with the right bracing and the right covers and you have ensured that you have a suitable storm/tie down kit to secure it, then your only other concern is cleaning, maintaining and storing the marquee. A good quality PVC marquee (500gsm to 720gsm – Belgian PVC) will be coated with an anti stain and an anti mildew, UV protective coating, this will be on the outside of the PVC and will be shiny to touch. 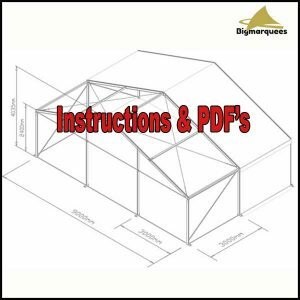 This coating is to stop the marquee panels from dulling, marking and staining. This coating will also make it very easy to remove any dirt or foreign objects from your marquee covers with little effort. 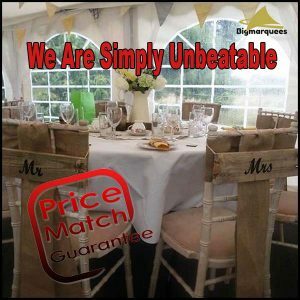 So the rule is that every time you have finished using your marquee, you ensure that while it is still erected, you wipe all surfaces down with some warm soapy water and then rinse and leave to dry. 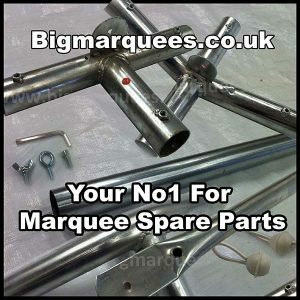 This will keep your marquee in good order for many years to come. 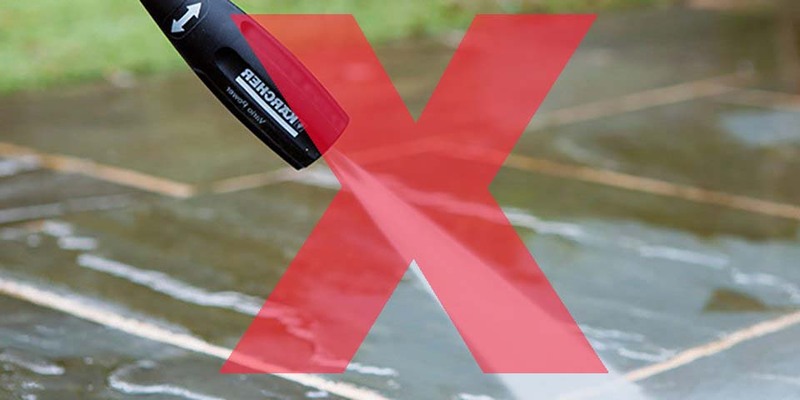 Ensure that when your marquee is up for more than a couple of days that you regularly wipe it down with soapy water and regularly check the tension on all of your tie down straps. Remove any bird mess as soon as possible as many certain bird mess will etch into the PVC and burn the coating away. 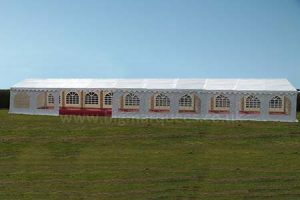 When a marquee is not actively being used but is still erected, ensure that all panels are secured, ensure that the whole marquee is closed to the wind and that all run off skirts are pegged to the ground ensuring that no wind can get inside the marquee. 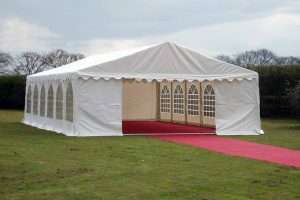 Ensure when erecting or packing away a marquee with window panels that the panels are at room temperature before being folded or unfolded to avoid the clear window PVC from splitting. Never Jet Wash marquee panels… The water will be forced under the UV coating and then this coating will detach from the PVC. Always put a marquee away dry. 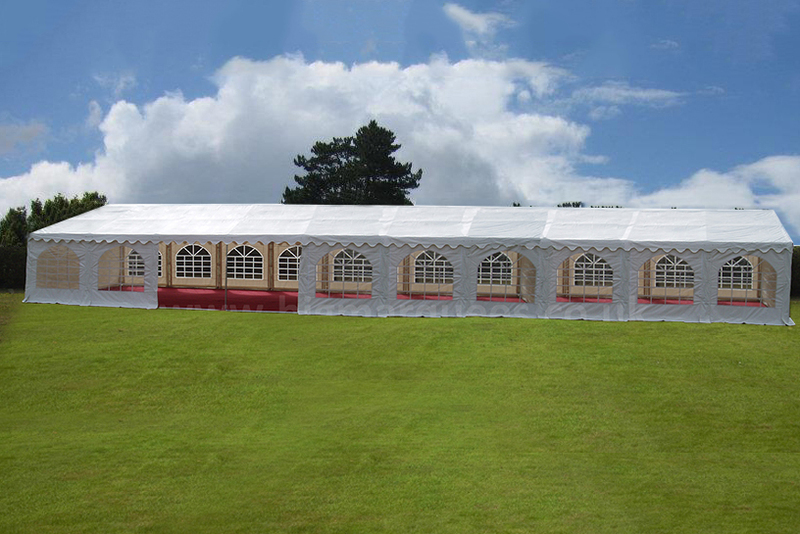 Ensure that wherever possible your marquee is stored at room temperature, where this is not possible, try to ensure that the window panels are stored at room temperature and at the very least, warm window panels to room temperature the day before unfolding them to fit to the marquee. ENSURE EVERYTHING IS DRY BEFORE LEAVING IT STORED.